Matt Claman followed his dream and came to Alaska in 1980, working as a cook in remote mining camps. After graduating from law school, Matt returned to Alaska to make his home, raise his family, and establish his career. Matt was elected to the Alaska State House in November 2014 and has been serving since January 2015. He is known as as a reasonable, hard-working legislator who is dedicated to finding solutions that work for Alaska and the West Anchorage community. Prior to service in the State House, Matt served on the Anchorage Assembly beginning in 2007. His colleagues unanimously elected him Chair of the Anchorage Assembly in 2008. He became the Acting Mayor of Anchorage in 2009 when then-Mayor Mark Begich became our United States Senator. As Acting Mayor at the height of the 2008-2009 financial crisis, Matt tackled difficult fiscal decisions and moved the community forward. He led efforts to reduce the municipal budget by $20 million, approximately 5%, and negotiated concessions with bargaining units to achieve a balanced budget. An attorney for over 29 years, Matt has served the needs of Alaskans and understands a lawyer’s role in helping people solve problems. He has represented commercial fishermen, loggers, families in crisis, local businesses, and individuals. He managed his own small law business for over 11 years. A skilled teacher, Matt taught law classes at the University of Alaska Anchorage. 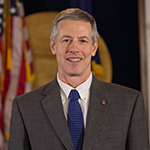 His colleagues elected Matt to the Board of Governors of the Alaska Bar Association in 200 – and its president in 2007. Matt has also served on the Heritage Land Bank Advisory Commission and on the board of several local non-profit organizations. Matt Claman and his wife Lisa Rieger have raised two children in Anchorage. Maia and Ben both graduated from West Anchorage High School. Matt is a licensed Emergency Medical Technician (EMT) and accomplished professional wilderness guide. An active hiker, biker, boater, and skier, you’ll often find Matt enjoying the beauty of Alaska with friends and family on our trails and in our parks.